The CompTIA A+ Essentials exam measures the necessary competencies for an entry-level IT professional with the equivalent of at least 500 hours of hands-on experience in the lab or field. Hands-on experience or equivalent knowledge includes installing, building, upgrading, repairing, configuring, troubleshooting, optimizing, diagnosing, and performing preventative maintenance of basic personal computer hardware and operating systems. A+ certification ensures the right people have the right skills. While many of the essential skills are universal, there are additional skills required to support the needs of businesses. By offering alternative validation paths for specific job scenarios, Our A+ training course gives individuals the ability to grow their careers in a certain area, and employers the flexibility to choose the validation that best fits their needs. The CompTIA A+ certification is one of the most widely established computing qualifications. A credential recognised by both public and private sector organisations. We will help you accomplish your CompTIA A+ certification ambitions by preparing you for this examination. You'll get the best instructor-led training, at your convenience in the form of high quality interactive training videos. What is A+ Certified ? The certification is an industry recognized credential that certifies the competency of PC Service Specialists. It is sponsored by the Computing Technology Industry Association (CompTIA) and tests are administered by Sylvan Prometric. The program is backed by over 50 Major computer hardware and software manufacturers, vendors, distributors, resellers, and publications.This course provides a wealth of benefits to any person seeking a job in the computer industry! Whether you are considering entering the computer industry or considering advancing your career, the A-Plus certification is a must! Being good at your job is not enough! A+ certifies the abilities of PC Service Specialists and will help you achieve the earnings you are worth. Pre-requirement for anyone interested in MCSE certification training . Whether you are considering entering the IT industry or considering advancing your career, Our A+ training course provides students with the knowledge and skill at your convenience. You are in complete control. We invited the Best CompTIA A+ Certified Trainers in the industry to help us develop the ultimate training and certification program which includes everything you will need to fully prepare for and pass your certification exams. 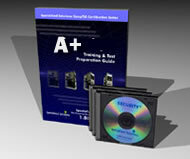 A+ Certification is the computer industry recognized credential that certifies the competency of PC Service Specialists. It is sponsored by CompTIA - the Computing Technology Industry Association, and tests are administered by Sylvan Prometric. Because of our instructor's unique qualifications, you can be assured that our A+ course is top-notch. In fact, we believe it's the best course available because we examined the other A+ training classes and carefully thought out our own. Our CompTIA A+ certification is an international industry credential that validates the knowledge of computer service technicians with the equivalent of 500 hours of hands-on experience. Major hardware and software vendors, distributors and resellers accept CompTIA A+ as the standard in foundation-level, vendor-neutral certification for service technicians. This bundle package includes the CompTIA A+ Certification Essentials Support Skills and CompTIA A+ Certification Electives Support Skills. The course will teach support newcomers the fundamental principles of supporting desktop and portable computers and operating systems. The "CompTIA A+ Essentials" (220-601) exam as well as one of three job-role specific exams. Candidates may choose among the CompTIA A+ IT Technician exam (220-602), the CompTIA A+ Remote Support Technician exam (220-603), or the CompTIA A+ Depot Technician exam (220-604). £114 +VAT (each). 2 Exams required. Course Length - 150 Hours. To become A+ Certified, pass the A+ Essentials exam & one of the A+ Specialist exams.